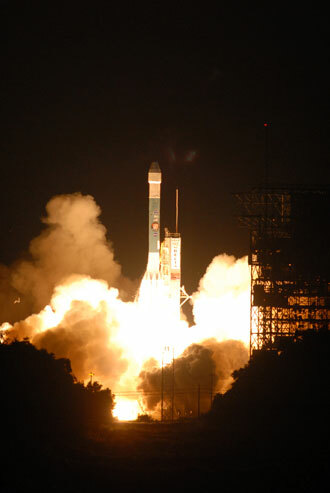 At twenty-six minutes past seven last night, NASA sent it’s latest Mars probe – Phoenix– on it’s way. Well might you say, dear reader, "So what?!" It’s not as if NASA hasn’t sent robotic space vehicles to Mars before. You’d be correct, and 50% have either failed to arrive or been lost after atmospheric entry. Enormous wastes of money and scientific resources. Or is it? Consider this mission. Phoenix will arrive at Mars on May 25, 2008 but will not land as the last several missions have, by bouncing along the surface surrounded by large inflated balloons. Phoenix is much more sophisticated in that it will descend via high-speed parachute, then at a pre-determined velocity, jettison the ’chute and continue braking by pulsed landing rockets. Just like in the Sci-Fi flicks. Phoenix is not a mobile rover like Spirit and Opportunity. Phoenix is more akin to the Viking landers of thirty years ago, yet far, far more technologically advanced. Phoenix will land in the planet’s northern polar regions to search for evidence of sub-surface water ice and frozen hydrogen. Vital necessities for sustaining any future human presence. Phoenix will also be continuing the search for evidence of microbial life on Mars, as a part of NASA’s longer term Mars Scout missions. Fascinating stuff, but what does it do for those of us left here on Earth? Well, succinctly….nothing. However, for the species as a whole, these ventures into space expand our collective knowledge of the Universe we inhabit, thereby ensuring our continuance as an intelligent species into the future. How we use that intelligence is, of course, contentious, but from my perspective, as long as humanity continues to pursue this level of knowledge in spite of the political intrigues and wasteful, careless attitudes exhibited to our survival by our general society here on Earth, then perhaps we will still have an avenue for retreat when our handbasket finally rolls to a stop in front of Cerberus at some point in the future. I’d happily take a one-way flight there just for the chance to stand on another world, no religion, above … only sky. And spend what ever time left setting up the processors necessary for the first colonies. It’s now clear that the best strategy is to manufacture oxygen & other eseentials from what’s available rather than try to (space)truck it there. Even on the Moon this would be possible for slightly different reasons – there may be no indigenous water but always the chance that some comet or meteor dumped a load which may have ben held together by the 1/10 gravity in the form of H20. But on the Moon there solar radiation is undimmed by even a thin atmosphere and thus PV & even radiant heat collectors/pumps would gather ergs like crazy.